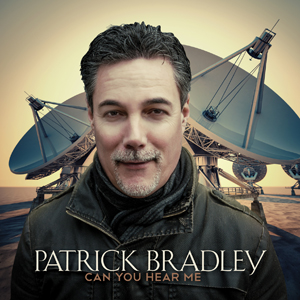 On the day of the release of his third album titled “Can You Hear Me“, Patrick Bradley was thrilled that fans would finally hear his new project. Bradley has spent his life playing music; he taught himself at an early age. His instrument of choice was the organ, and he displays his keen skills playing the Hammond organ on this album. The sound he projects is profoundly crisp and is a pleasure to hear. It is a rare opportunity to hear a Hammond organ played in music these days. Although Patrick has a career as a business man working for Whole Foods Market, he has never strayed from his love of music. He has always written songs and is fortunate to have made three albums. Patrick wrote this album with the concept in mind of blocking out the noise that surrounds us all of the time along with the idea of having his music speak louder. The title and first radio single is a reflection of that premise. The song and title (“Can You Hear Me”) came to him at once as he wondered if his late mother could hear his music. Making this album even greater, he joined forces with producer Jeff Lorber whom also produced his second album “Under The Sun.” Together, their chemistry is the perfect formula for making music magic. “Can You Hear Me” features Dave Koz, Rick Braun, and Eric Marienthal. Also adding their musical chops to the project are Jimmy Haslip, Gary Novak, David Mann, Dwight Sills, and Michael Thompson. The pulse of “Can You Feel It” can truly be felt throughout Braun’s entire latest release. On every funky tune, you hear the resounding theme loud and clear, no matter whether it is “Get Up And Dance” or “Another Kind Of Blue.” As Rick looks forward to the release of his sixteenth album, he feels blessed to have fans old and new who love his music. Embarking on this journey, he wanted to encompass the vibe of “Beat Street.” When it was all said and done, Rick Braun’s intent to create organic music with his friends and create a funky album with a real experience was accomplished. He humbly gives credit to Philipe Saisse, Brian Culbertson, Euge Groove, Jeff Lorber, Elliot Yamin, and Dave Koz whom collaborated with him to breathe life into his project. From beginning to end, “Can You Feel It” will take you on a funky, musical ride. Ironically, Rick’s birthday is 2 days before the July 8th release date of “Can You Feel It.” I have a feeling that he is going to have many reasons to celebrate this year. Rick and I talk about the unmistakable funkiness of this album. Sherman Oaks, Calif. (29 May 2014): It’s been five years since trumpeter-flugelhorn player Rick Braun released an album full of the funky R&B contemporary jazz grooves that made him one of the genre’s most consistent hitmakers over the past twenty years, but the award-winning musician, producer and songwriter returns to his signature sound July 8with the release of his sixteenth album, “Can You Feel It,” which will be issued by Artistry Music/Mack Avenue Records. A bona fide contender as the feel good anthem for the summer of 2014, Braun’s “Get Up And Dance,” a collaboration with tenor sax sensation Dave Koz, is already collecting radio playlist adds. After scratching a creative itch to croon jazz standards on his two most recent releases, “Sings with Strings” and the holiday-themed “Swingin’ in the Snow,” Braun had a very specific direction he wanted to pursue for “Can You Feel It” for which he wrote or co-wrote nine tunes along with helming the production. “When I started working on this album, which was about a year in the making, there were two goals that I had in mind. I wanted it to be really organic and have a lot of my friends playing on it. Young players melding together with the old faithful,” explained Braun. Braun added a new weapon to his arsenal: valve trombone. And he stacked the tracks with layers of horns section parts adding power, punch and potency. His friends were eager to join the festivities enabling Braun to toss the ball around the horn with Koz, Brian Culbertson, Philippe Saisse, Jeff Lorber, Euge Groove, Elliott Yamin and a retinue of ace players such as Frank “Third” Richardson, Nathaniel Kearney Jr., Randy Jacobs, Nate Phillips, Adam Hawley, Sergio Gonzalez, Brandon Fields, Tony Moore, Phil Davis, Ramon Islas and more. Bud Harner, who co-wrote the first single with Braun, helped shepherd the album as associate producer. A popular and dynamic performer who draws material for his set lists from his vast catalogue of No. 1 chart hits, radio playlist staples and fan favorites, Braun is touring nationally in support of “Can You Feel It” as a member of Jazz Attack with fellow contemporary jazz titans Peter White and Groove. Sprinkled in his concert calendar are dates with BWB, the all-star trio made up of Braun and Grammy winners Kirk Whalum and Norman Brown. The Allentown, Pennsylvania native entered the professional ranks by co-writing a Top 20 pop hit for REO Speedwagon (“Here With Me”) before becoming a first-call sideman touring and recording with Rod Stewart, Sade, Tina Turner, Natalie Cole and Tom Petty. Braun released his solo debut, “Intimate Secrets,” in 1992, but it was the success of “Beat Street” that forced the horn man to choose between continuing as a sideman and taking center stage as an artist. The decision came easily and Braun has never looked back on the path to stardom. The year of 2014 is off to a great start for Eric Essix. He is enjoying a multitude of success from his latest release “Evolution” and planning an event with a purpose. 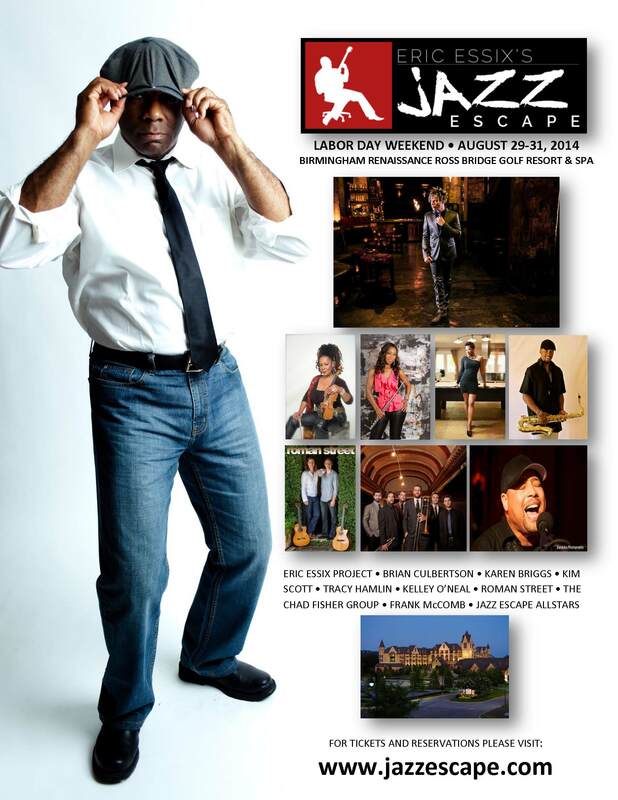 The Eric Essix Jazz Escape will be held in Birmingham, Alabama on August 29-31 this year. This will be the first year of the Escape that Essix plans to have annually–very appropriately named an Escape versus a festival because that is what Eric intends the experience to feel like. The Jazz Escape will be held at the Renaissance Birmingham Ross Bridge Golf Resort & Spa. The line-up for the three day event will include Brian Culbertson, Rick Braun, and Essix’s own band just to name a few. All the proceeds from the Jazz Escape will go directly to Eric’s non-profit foundation, The Eric Essix Foundation for the Arts and Education. Eric talks with me about his vision and plans for Jazz Escape. 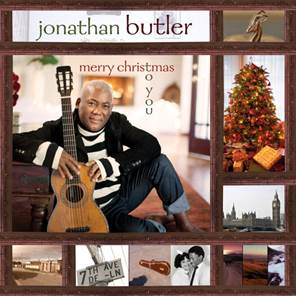 For Jonathan Butler, Christmas is a very special time of the year. The holiday represents precious time spent with family and the birth of Jesus Christ, both priorities to Jonathan. Thus, the release of his first Christmas album: “Merry Christmas To You.” The title track, penned by Butler, is a beautiful ballad expressing affection for those we love. His instrumental rendition of “Sleigh Ride” encompasses his native South African vibe. Jonathan is joined on this project by fellow friends and musicians Dave Koz, Rick Braun, Dan Lutz, Paul “Shilts” Weimer, and his daughter, Jodie Butler. “Merry Christmas To You” and “Sleigh Ride” will be released this season in time for the holidays. His faith and the gift of music are what continually sustain him. As a youth, it was music that enabled him to break through barriers and achieve tremendous success. His desire to spare youth from the snares of drugs and poverty compelled him to launch the Jonathan Butler Foundation in South Africa. The foundation aims to impart music into the lives of children, consequently giving them the tools to change the outcomes of their future. Jonathan tells me just what “Merry Christmas To You” means to him. sailing to the gorgeous Mexican Riviera. St. Louis, Missouri (24 June 2013): If there has been one complaint among passengers who have sailed aboard The Smooth Jazz Cruise during its first decade it is that there are so many extraordinary concerts and events to attend that it is simply impossible to see and do everything during the 7-day music vacation experience. Wait until they find out what is planned for the first-ever West Coast departure of the perennially sold out luxury cruise to music paradise sailing to exotic Mexican Riviera ports October 12-19. With an astounding 60 concerts slated and a jam-packed program of unique first-time events, excursions and opportunities exclusively available during the West Coast Jazz Party at Sea, this adventure bodes to top all previous cruises, including the traditional January sailing that sold out for 2014 in record time. R&B jazz luminaries Brian Culbertson and Boney James will host the cruise embarking from San Diego aboard Holland America’s m/s Westerdam en route to Cabo San Lucas, Puerto Vallarta and Baja Coast with a starry cast of Grammy-winning and chart-topping performers featuring David Sanborn, Marcus Miller, Tower of Power, Candy Dulfer, Jonathan Butler, Oleta Adams, Rick Braun, Norman Brown, Richard Elliot, Euge Groove, Earl Klugh, Kenny Lattimore, party band DW3 and music director Brian Simpson. When the live music pauses, legendary MC Biz Markie and Cool V will DJ to keep The Greatest Party at Sea grooving on the dance floor, and comedian Alonzo Bodden will provide the laughter. · Wall to wall live music. The usual program offers 40 shows. 60 concerts will be staged on the October cruise. · Guests will have the once in a lifetime opportunity to take a one-hour music lesson from the stars with the fee going to charity. · At a first-ever songwriting seminar, Culbertson and the band will compose a new song on the spot with direct input from the audience. · During the “Opening Act” talent contest where guests get to show off their own musical gifts, cruisers will judge the opening rounds of the competition with Culbertson, James and Dulfer ultimately determining the winner who will earn the privilege of opening for the headliner and perform with the cruise hosts on the final night of the voyage. · When in Puerto Vallarta, guests will enjoy artist hosted excursions such as play golf with Braun, ride horseback with Elliot, sightsee with Culbertson, participate at an outdoor challenge with Butler, explore hideaways with Simpson, or join Dulfer for a swim with dolphins. · While at sea, cruisers can battle Culbertson and James in a ping pong tournament, take a yoga class with Klugh or shoot hoop with Miller. · For the romantically inclined, couples can renew their wedding vows during a ceremony presided over by Butler. · On a theme night designated to support Pinktober, national breast cancer awareness month, guests are encouraged to wear pink. Each cruiser will be given a commemorative pin and when they give the card accompanying the pin to the front desk, they will be making a $5.00 donation to fight breast cancer with cruise producer Entertainment Cruise Productions donating matching funds. · “Backstage Pass” will be filmed nightly aboard the ship in front of a live audience for national television broadcast. Host Dane Butcher will interview each of the cruise stars. · For the first time, premium reserved seats for the main shows in the Vista Lounge theater are available for all guests who book their cabins by July 31. Guests have fallen in love with The Smooth Jazz Cruise ever since its maiden voyage in 2004. Much more than a jazz festival and much more than a vacation, cruisers spend an entire week completely immersed in the music. On top of the stellar concert performances with Dream Team pairings that take place nightly in the theater and in more intimate nightclub venues aboard the vessel, guests interact daily with the musicians at cocktail parties, poolside games and activities, informative seminars, autograph sessions and cooking demonstrations. It’s an unforgettable first-class lifestyle experience that keeps fans coming back year after year. Cabins for the October sailing are still available and can be reserved by calling toll-free 888.852.9987 in the U.S. & Canada and +800.852.99872 internationally. For more information, please visit http://www.thesmoothjazzcruise.com. The world leader in full ship charter music cruises, St. Louis, Missouri-based Entertainment Cruise Productions, LLC (ECP) owns, produces and promotes The Smooth Jazz Cruise and The Jazz Cruise (www.thejazzcruise.com), and is proud to partner with Time Life for the Soul Train Cruise (www.soultraincruise.com), Malt Shop Memories Cruise (www.maltshopcruise.com), The Country Music Cruise. (www.countrymusiccruise.com) and Celtic Thunder Cruise (www.celticthundercruise.com). Pleasing guests is Entertainment Cruise Productions’ most important goal and objective while providing luxurious vacation experiences featuring marquee stars from their respective music genres in an extraordinary setting for devoted passengers, many of whom make the fun and exciting cruises an annual affair. Additional information is available at http://www.ecpcruises.com.